Easter is a fun time for children and families in St. Louis. Kids can go on an egg hunt, see baby animals, and even have breakfast with the Easter Bunny. Whether you want to attend a religious ceremony or just want to do something fun with the kids for the holiday, there's plenty to do in St. Louis on your Easter vacation. From festive Easter brunches to city-wide egg hunts, your family is sure to enjoy their trip to St. Louis this spring. In 2019, Easter Sunday falls on April 21, but festivities take place during several weekends in April. Children are invited to the West County Center shopping mall to take pictures with the Easter Bunny. Each year, kids get a chance to meet the Easter Bunny on Level 1 of the mall near Macy's. The annual free Hare in the Air egg hunt is true to its name—the Easter Bunny arrives by helicopter. 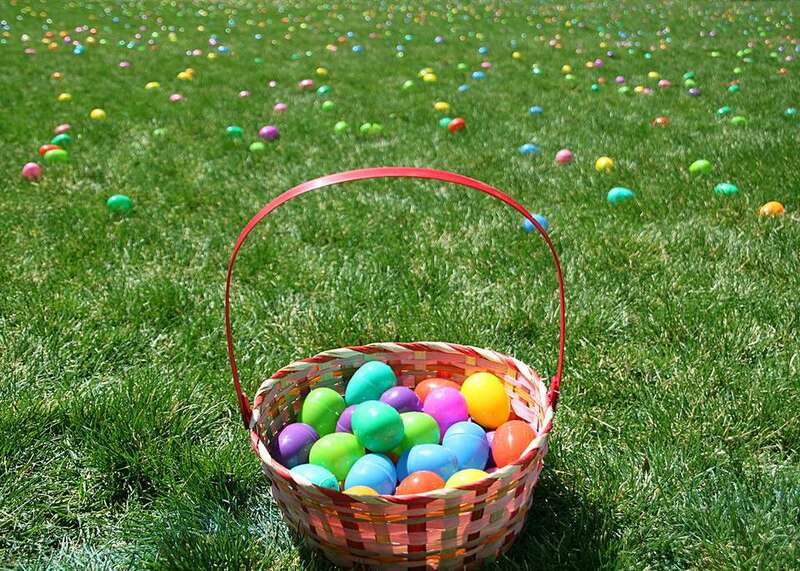 The Easter Bunny arrives at 9:30 a.m. and the egg hunt is divided into age groups with special prizes for each group. Parents are not allowed inside the hunt area and everyone needs to bring their own basket. The event also includes other fun activities like balloon artists, costumed characters, and a petting zoo. Children in St. Charles County can enjoy breakfast with the Easter Bunny at Memorial Hall in Blanchette Park on Saturday, April 13, 2019. Kids can also make crafts, go on an egg hunt, and get their pictures taken with the Easter Bunny. The cost is $15 a person, but children two and younger are free. The biggest Easter egg hunt in the Metro East is at Eckert's Orchards in Belleville every weekend starting Saturday, April 6, 2019. Hunting for eggs isn't the only fun for kids. There are also baby chicks and bunnies, face painting, visits with the Easter Bunny, and plenty of Easter treats. The cost is $12 per child, and egg hunts are held on the hour between 9 a.m. and 3 p.m. on April 6, 7, 13, 14, 19, and 20, 2019. Another fun option at Eckert's Orchards is Breakfast with the Bunny. Families can enjoy a hearty breakfast of scrambled eggs, hash browns, sausage, biscuits, and gravy from 8 a.m. to 11 a.m. at the Country Restaurant. The cost is $6.99 for children and $12.99 for adults. Older kids who still want to have a little Easter fun can take part in the Tween Egg Hunt in Deer Creek Park on April 12, 2019. The event includes a pizza dinner, followed by an evening egg hunt by flashlight. Children ages 10 to 14 are invited to participate. The cost is $7 a person, and residents of Maplewood and Richmond Heights get a $2 discount. The cities of Maplewood and Richmond Heights are hosting a free egg hunt for children at the A.B. Green Athletic Complex located at Laclede Station Road and Dale Avenue. There will be hunting areas for children ages 3 and younger as well as different areas for those aged 4 to 5, 6 to 7, and 8 to 10. In all, kids will have the chance to collect more than 10,000 eggs, and the egg hunt starts promptly at 11 a.m. The event takes place a week before Easter on Saturday, April 13, 2019. Six Flags is joining in the fun of the holiday with an egg hunt for children ages ten and younger for Easter. Kids will have the chance to find eggs filled with candy before the park opens. The egg hunt is free with Six Flags admission, but you must get a special wristband to participate. They're also offering a special discount for season pass holders to bring a friend for cheap the whole weekend. The St. Louis Zoo is hosting a different kind of egg hunt on Easter Sunday, April 21, 2019. Visitors can watch while the Zoo's animals hunt for eggs and enjoy special Easter treats from 9 a.m. to 4 p.m. Visitors who buy a Safari pass, animal adoption, or membership on Easter Sunday will also receive a special treat. The Magic House is following in the steps of the White House by hosting an Easter Egg Roll the Monday after Easter, April 22, 2019. Children 12 and younger can gather on the front lawn of the museum in Kirkwood to roll eggs with large spoons in a race to the finish line. There will also be egg decorating, story time, and a visit from the Easter Bunny. The egg roll event is free with a paid admission of $11 per person to the Magic House. It will also be hosting a Bunny Breakfast on April 14, 2019 if eating eggs instead of hunting eggs is more your thing.